The Red River Zoo’s Family Campout series returns for Summer 2019! At this fun and exciting event, you and your family will have the opportunity to camp out on the Zoo’s lawn while spending the evening learning about wildlife, outdoor recreation and more. Participants will experience unique activities including unique animal encounters, marshmallow roasting, movie marathons, crafts, early morning bird watching, a special Lights-Out Tour and more. The final camping schedule is still being planned, and itineraries will be sent out to registered participants closer to the camp out weekend. A minimum of one adult over the age of 18 is required per group of (5) child campers. All campers under the age of 18 must be accompanied by a parent/guardian or chaperone at all times. $75 Family Camper Bundle; includes admission up to four campers. Successful completion of the registration and payment reserves your spot within the Family Campout. Available spots are limited. Registration will close (3) days before the scheduled date. Reserve your spot now! 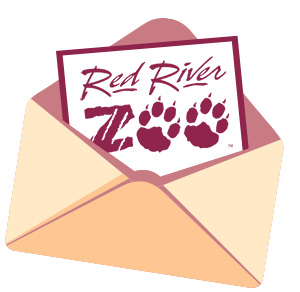 Come celebrate Father’s Day by taking a camping trip here at the Red River Zoo. We might still be in Fargo, but there will be plenty of Wildlife to see and ways to enjoy the outdoors. Activities and programs will begin the evening of June 15th at 7:00pm and end the morning of June 16th at 9:00am. Didn’t get enough of the Zoo? Enjoy the Zoo for the day with complimentary admission for June 16th. Summer will soon come to a close, but there is still time for more outdoor fun! Join us for another adventure and learn what type of activities we can do outside all year round. Activities and programs will begin the evening of August 2nd at 7:00 pm and end the morning of August 3rd at 9:00 am. Didn’t get enough of the zoo? Enjoy the Zoo for the day with complimentary admission for August 3rd. The Red River Zoo has a limited number of dome tents available for rent for the Family Camp Out. Tents are $15 per tent and tent rental fees are non-refundable. Get occasional alerts on upcoming events and updates on our animals. Red River Zoo does not share your information with anyone. As conservation leaders, the Red River Zoo connects our community to nature and inspires people to help save species. Members enjoy free admission, gift shop discounts, and invitations to special events! Zookeepers to the rescue! Red River Zoo keepers worked around the clock to ensure baby camel’s health. Is love in the air at the Red River Zoo? Give the gift they won’t want to re-gift!